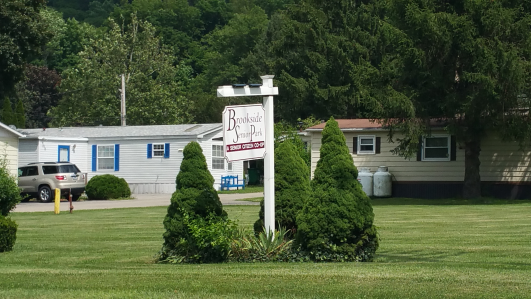 Welcome to Brookside, a senior citizen mobile home cooperative. By moving here, you can be a shareholder of a corporation that manages affordable homes for senior citizens of New York State. We share a quiet community of about fifty homes. Each of us owns a mobile home and occupies it as a household of one or two. We share ownership of the land through equal shares of stock, and we care for our co-op via an elected board of directors and a contracted management company. Each shareholder pays an equal monthly common fee plus taxes. These payments cover maintenance of common areas (utilities, grass cutting, tree care, leaf removal, snow plowing, etc.) and, for each individual home, water, sewage processing, garbage collection, recycling, and leaf removal in the fall. We do all this for ourselves for less than half what we would pay at a privately owned park. Unlike most mobile home parks, nobody outside is making decisions for us. Nobody raises our rent, decides on quality of maintenance and services, or decides what we can do. It's all ours and we do more with less because nobody is taking a profit. We spend wisely, pay our bills on time, keep our utilities functioning well, and keep our grounds looking good. We have quarterly meetings of shareholders to discuss issues, elect our board of directors, and vote on rules and expenditures. We distribute a monthly newsletter to keep ourselves informed. We live in a beautiful park and we are the owners. Brookside Park is in Cold Spring NY, in Putnam County near the Hudson River.